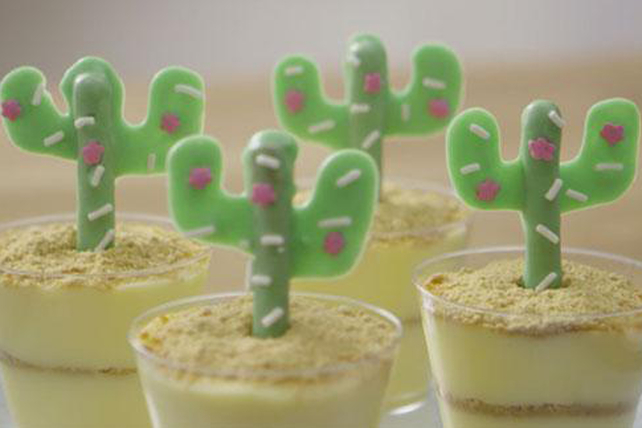 Gather up them cowpokes to help you prepare these Cactus Pudding Cups. This yummy western themed food idea is perfect for your child's birthday party. Cover baking sheet with parchment. Mix melted chocolate and food colouring until blended. Dip pretzels, 1 at a time, into chocolate, turning to completely coat each pretzel stick with chocolate; place, 4 inches apart, on prepared baking sheet. Spoon remaining melted chocolate into resealable plastic bag. Cut small piece off one bottom corner of bag; use to pipe chocolate onto both sides of each pretzel stick to resemble arms of a cactus. Decorate with sprinkles as shown in photo. Refrigerate 30 min. Meanwhile, beat pudding mix and milk with whisk 2 min. Layer half each of the pudding and graham crumbs in 4 (5-oz.) plastic cups; repeat layers. Refrigerate until ready to use. Stand chocolate cactus in each pudding cup just before serving. Practice mindful eating by savouring the flavour of this pudding cup and sticking to the recommended serving size.